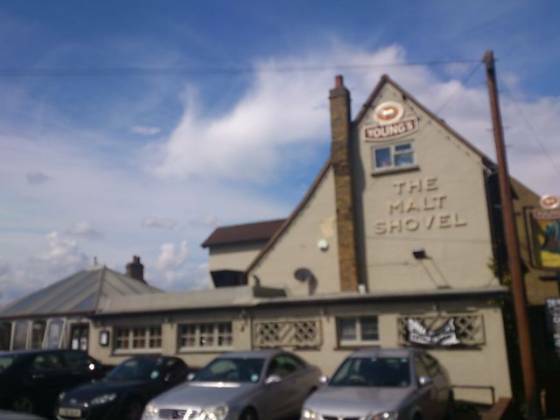 After another hunt around online, I found a place for Sunday lunch in Dartford – The Malt Shovel. It is a Youngs pub, and our previous experience of these venues have been very positive (such as our Sunday lunch at The Bull’s Head Hotel in Chislehurst). Booking was very easy, I just gave them a call and requested a table for 1:30pm. Driving to the pub wasn’t too much of an issue, but their car park has a lot to be desired. Literally 6-8 car parking spaces, thankfully, there was a lot of parking space available on one of the roads close by. The outside looked quite shabby, Claire didn’t actually want to eat here, I wanted to give it a go though. Walking through a conservatory area, we entered the bar section. It felt very local, with quite a few blokes having a lunch time drink. I mentioned to the lady at the bar about our booking, requested a couple of drinks and was then shown to our table in the conservatory. It was a nice room, we were opposite a set of double doors that opened to a patio area (I believe there was a covered smoking area too, I didn’t explore this part). The decor showed they were a proud pub, with some medals / cups dotted about the place – the bar area was quite dark, but the restaurant / conservatory was nice and bright. A few families were here, so it did seem a popular pub for most people. After looking at the menus on the table, I wandered back to the bar to order food. A huge selection of meat options available, they were certainly covering all options. I was pleased to see that cauliflower cheese was also on the menu :-) Claire wanted the Roast Beef, I once again chose the Roast Lamb. Food came out around 15-20 minutes late… my, what a huge amount of food! 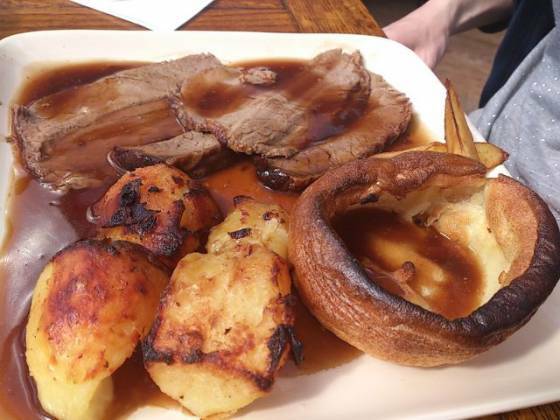 We both had quite large and square plates with lots of meat, yorkshire pudding, roast potatoes, roast parsnips and gravy. 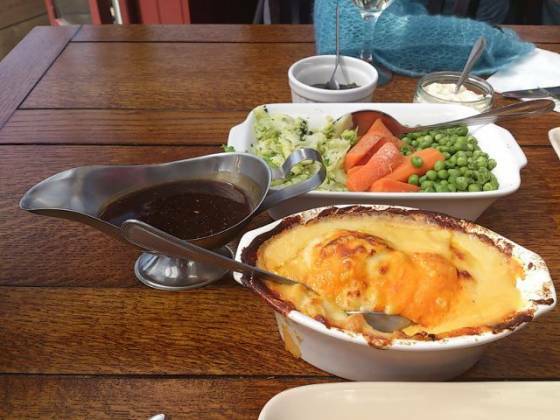 We then had a dish with our vegetables and even cauliflower cheese! And, an extra jug of gravy too! This was an amazing amount of food – and all for £8.95! 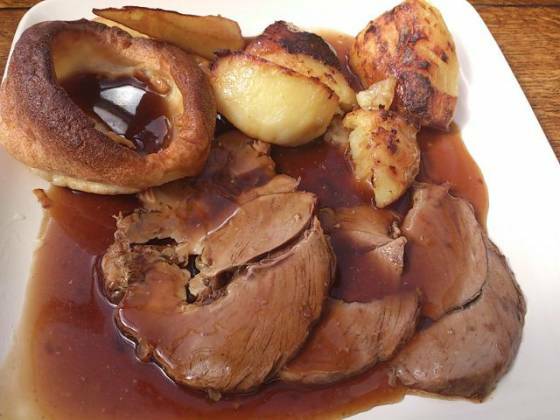 The roast beef was well done, no pinkness – Claire enjoyed it. My lamb was good too. The 4 roast potatoes each were really nice, fluffy with a little bit of crisp on the outside. The vegetables were: carrots, peas, cabbage, roast parsnips and cauliflower cheese. All very good, especially the cauliflower which seemed to have at least two types of cheeses! Yorkshire puddings were on each plate (I am a bit of a purist sometimes, and almost wouldn’t have minded not having a Yorkshire – I am sure others are not like this though, and they definitely would not get marked down for this!) and tasted fresh. Lastly, we had extra gravy – which complimented the meal perfectly and didn’t overpower the meal. The Malt Shovel served so much food, I wasn’t able to even consider looking at the dessert menu (which were priced between £2.50 for the special up to £3.75). So, I went to the bar to pay. Unfortunately, there only seemed to be a couple of people serving, and the bar area was very busy which meant I was waiting a bit longer than necessary to pay the bill. The bar lady (I believe was the manager) was polite and apologetic which more than made up for the wait.